BELGRADE, Serbia — Serbia’s president pledged on Sunday to defend the country’s law and order a day after opposition supporters stormed the national TV station protesting what they said is his autocratic rule and firm control of the media. As Aleksandar Vucic held a news conference in the presidency building in downtown Belgrade, thousands of opposition supporters gathered in front demanding his resignation. 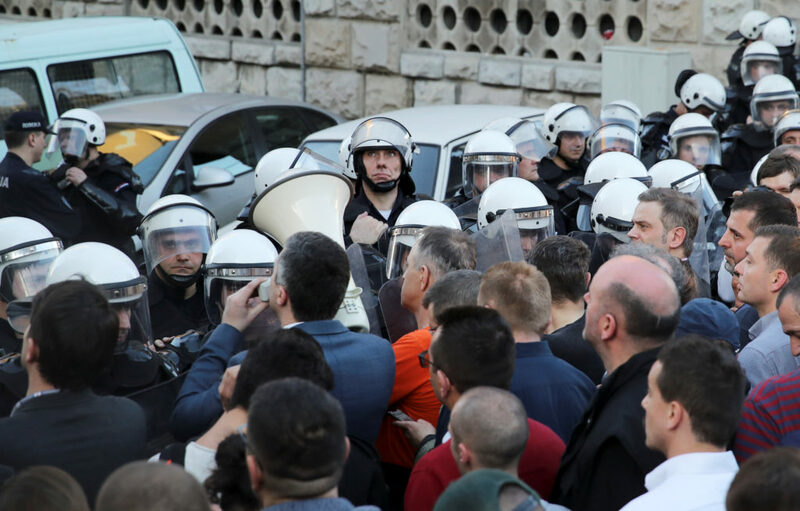 Skirmishes with riot police were reported, including officers firing tear gas against the protesters who have pledged to form a human chain around the presidency to prevent Vucic from leaving the building. The pro-government Pink TV showed a photo of Vucic playing chess with the interior minister apparently inside the presidency. Police said they were attacked and the interior minister said the protest leaders must be “processed” as soon as possible. They said several demonstrators were arrested. 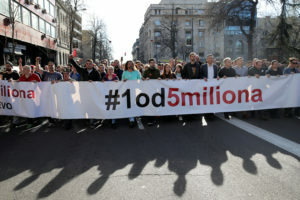 The crowd chanted “he is finished!” which was the slogan of the October 2000 uprising that led to the ouster of late Serbian strongman Slobodan Milosevic. “If they break in here, I will wait for them,” said Vucic, who tried to downplay the protesters’ numbers, insisting only about 1,000 people had gathered. “They think they have the right, 1,000 of them, to determine the fate of the country,” Vucic said. Riot police on Saturday night removed hundreds of people, including opposition leaders, who stormed the TV headquarters to denounce the broadcaster, whose reporting they consider highly biased. This was the first major incident after months of peaceful protests against populist leader Vucic. The demonstrators are demanding his resignation, fair elections and a free media. The protests began after thugs beat up an opposition politician in November. A former extreme nationalist, Vucic has said he now says he wants to lead Serbia into the European Union.